Clams seem to be one of those ingredients that people either take very seriously, or completely ignore. As a child, I remember being absolutely revolted at the sight of My parents and their friends slurping up mollusks during our annual New England lobster and clam bake. My young mind simply could not comprehend the apparent desire to lever gritty boogers from their gaping shells and choke them down after slopping them around in melted butter. Unfortunately, it took me year to learn how wrong I was. Clams are delicious. In fact, thinking about them right now is making my mouth water. It’s more than fair to say that my tastes have changed since then. Having moved from Massachusetts to Washington, where you don’t find littlenecks (the Eastcoast clambake staple), I’ve grown to love the West coast version: the manila clam. Manilas, which are actually a Japanese varietal, are characteristically smaller than quahogs, and I personally think that they’re sweeter and are a bit more firm. 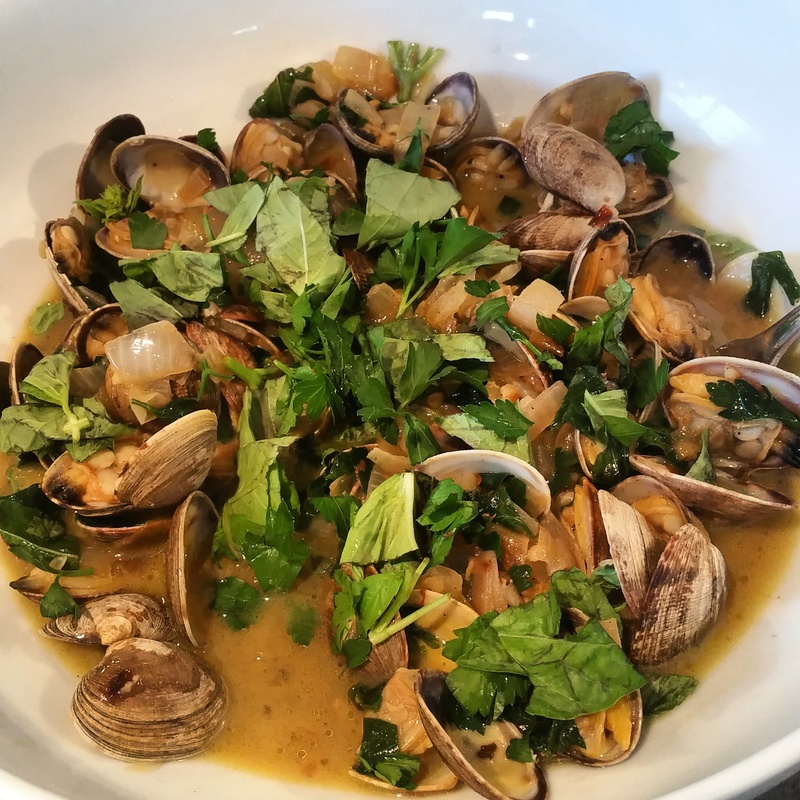 While the flavor of the manila clam is strong, and can certainly stand out on its own, I find that these little boogers are greatly enhanced when cooked with other strong but complementary to ingredients, like butter, beer and fresh herbs. I came up with the following recipe after finding live manila clams at the market for $5.49 a pound, a price I decided was too tempting to pass up. Prepare all ingredients as listed. In a large pot (I use my trusty Le Creuset crock pot) heat the butter and oil together over medium heat. Saute the onions and shallots for 3-4 minutes, and then add the garlic and reduce the heat to mid-low. Slowly cook the onions, shallots and garlic, stirring frequently, until they’re a nice, light brown. This might take four or five minutes over the reduced heat, so be patient. Add the clams and herbs, season the mixture with salt and pepper, and stir to combine. Pour in the beer, cover the pot (this is important to steam the clams) and return the heat to medium or mid-high. Beer note: I used a bottle of Pacifico for this step, because it was the only beer in the refrigerator that I could justify cooking with: Fremont IPA is for drinking, not for cooking. It will take a few minutes for the pot to get back up to temp after adding the cold beer, but once it does you should allow it to steam happily away until the clams pop open. This process might take 8-10 minutes or so, so watch the clams closely, and take them off the heat once they’ve opened up. Serve them up, with the broth and some good bread for dipping, in a large bowl or platter so everyone can dig in to their heart’s content. Oh, and don’t forget the bowl for the empty shells, there will be a lot of them! Looks fantastic! I may have to give it a try. Thanks for the recipe!